Captain America met another veteran with a vibranium shield last week. Rep. Dan Crenshaw, congressman for Texas' 2nd district and former Navy SEAL met with Chris Evans on Capitol Hill Friday. 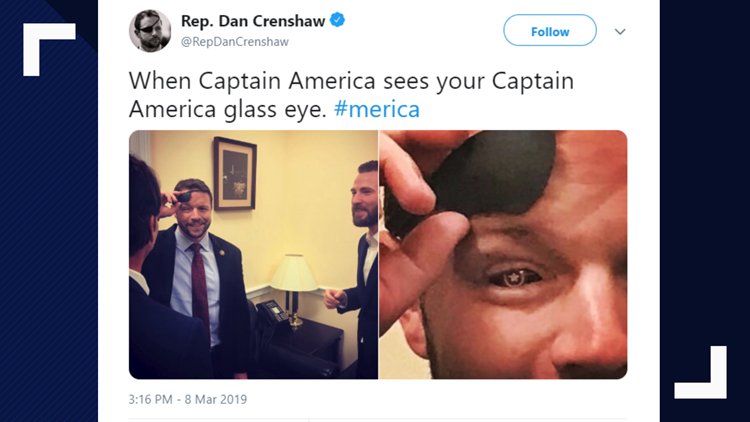 Crenshaw is a fan of Captain America, and showed off his glass eye to the Marvel actor. Crenshaw tweeted a photos of the two of them meeting. In the photos, he is lifting his eyepatch to reveal a glass eye with the image of Captain America's iconic star shield. "When Captain America sees your Captain America glass eye," said the congressman. Evans was very impressed, responding "A VERY cool use of vibranium." Crenshaw lost his right eye in 2012 after being hit by an IED blast in Afghanistan on his third deployment as a Navy SEAL. He made headlines shortly after his election when comedian Pete Davidson made fun of his eyepatch on "Saturday Night Live." Crenshaw later went on the show as a guest to make amends with the Davidson. Evans met with several lawmakers on the Hill last week to discuss education, workforce development, criminal justice reform and other issues. South Carolina Sen. Tim Scott also posted a photo with the actor. He may also have discussed a few spoilers for the upcoming "Avengers: Endgame." "Honor to meet you sir. Thank you for taking the time," Evans said. "And if you repeat the secrets I told you about Endgame, Marvel will make sure we BOTH turn to dust." Evans first made rounds at the Capitol in February, when he met with Democratic Senators before President Trump's State of the Union address.. A spokesperson for Evans told The Hill that the actor is working on a civics engagement project, but did not provide further details. Evans said back in February that he couldn't get into too many details on the secret project.